Inkin' It Up With Kendra! 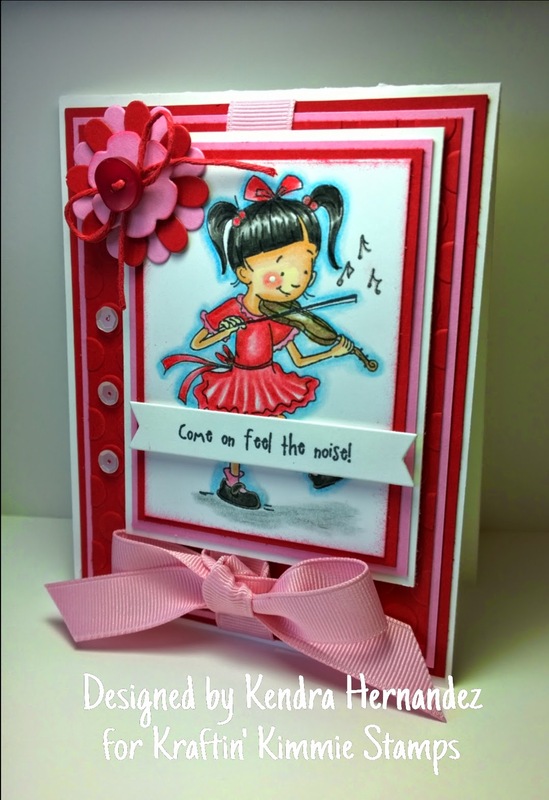 : Kraftin' Kimmie Stamps July Release Day! We're so excited! It’s our JULY RELEASE Day at KRAFTIN' KIMMIE STAMPS!! And we’re celebrating with a KRAFTY HOP!! So grab yourself a cuppa joe, sit back and be prepared for some krafty eye kandy! We're going to inspire your creations with our fun, new stamps! Over the last few days in our Krafty Peeks, we have shared lots of AMAZING new stamps from all our artists for our July release! We know these new stamps will inspire you!! We’ve got... an adorable new musical kids set from Cheryl called YOU'RE A ROCKSTAR! There's a furry new set from Thais called A KOALA-TY FRIEND! Lastly, we are SO excited to share a picture perfect new stamp set from Annie called....OH, SNAP! You will get to see ALL of the new images today as you sit back and enjoy our JULY Krafty Hop! As you hop from blog to blog, be sure to leave a comment at each and every stop because one lucky stamper will win a $25 gift card!! When you’re done hoppin’, be sure to head over to the Kraftin’Kimmie shop, because ALL the new images are available NOW! And don't forget...if you NEED it all, we have a Gimme Kimmies Kit which features ALL the new July stamps at a discount!! But only for a limited time! Adorable card. You done an amazing job on your Guest Design spot. So sweet in pink! You make such beautiful cards. I love the touch of the large pink ribbon and bow! So sweet love the colors and the pink ribbon!! Gorgeous girly card!!! Love the colours and a big bow. what a sweet card! your coloring is amazing! So many layers and they are so pretty. Great card. Soooo cute Kendra !! Love the colours and your colouring !! This is supah cute! : ) Love all those fabulous layers and the great color combo. Beautiful card with all the layers and colored so beautifully. I love all the sentiments in this set. Amazing card! I just absolutely adore it! Beautifully done!! Oh! So sweet! Great card! So cute! I am loving these stamps.